Feeling a little SL(tm)ow these days? The March Second Life Blogger Party will be in the Clocktower of Edloe Island where everyone can spend a little time together to wait out the impending clarification on the new trademark rules coming out Monday. Really bad 80's music courtesy of Crap Mariner of the What Is This Crap? weblog, which will be changing its URL mid-party as a result of the new rules. PS: If you haven't gotten one already, be sure to ask for one of Kit's Floaty TM Symbol sets. 10:00 AM until 11:30 AM SLT Meet at the Connolly Aerodrome in Caledon Penzance for a roll call of available pilots. Marshal Connolly, Air Chief Marshal Trenton, and/or ACM Messmer will take charge. "SL/LL needs to address those of us SL Bloggers, flickrites, etc more directly and answer our questions about all this. They should let us know what all this means to those of us who - after all - give them boat loads of free Buzz. 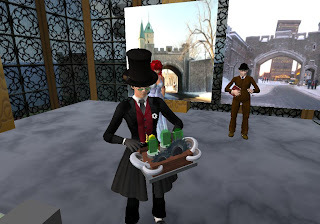 Blogging and micro-blogging is half the fun of my SL experience. 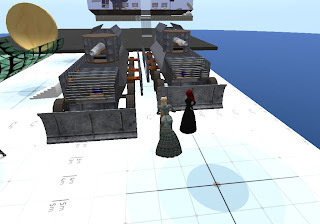 It's a way for me to "connect" to SL when I cannot go inworld. Taking this away would definitely reduce my SL experience." Since I lurve the submarines! 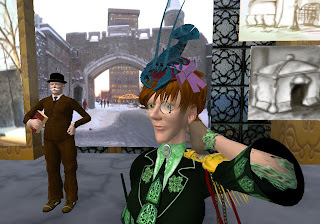 You know what we don't see enough of in Second Life? Submarines. With all the water available across the grid, I'm surprised that there are so many boats, and so few subs. In a world where there are deep oceans and hidden grottos, underwater travel is an amazing way to explore. 10:00 AM until 11:30 AM SLT Meet at the Connolly Aerodrome in Caledon Penzance for a roll call of available pilots...."
"....It’s been talked about a long time in the aviation grapevine, a new system on par with the classical TCS (Terra Combat System, the most widely used for combat equipped airplanes). Callahan’s system (known as CCC) is basically no longer updated and has slowly been abandoned, making TCS practically the sole ruler on the market. But now,VICE is here, the system for vehicle and infantry combat. Note that this is a system, which means it is not confined to a particular era. 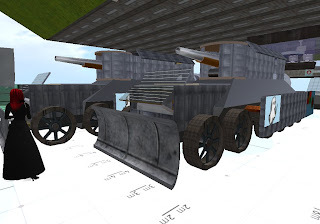 It can be added to basically any gun or vehicle, just like TCS’ versions. Behind the system are legendary names like Creem Pye, Acer Caproni and Mifune Thibaud (who according to aviatiors’ gossip is about to release a new plane soon)...."
"....Excellent dogfights episode of the battle of Leyte Gulf. Explains how "taffy 3" survived the battle. The destroyer U.S.S. Johnston displays unbelievable courage in blocking the Japanese aims..."
AUGUST 1943, 2 P-38 Lightnings attack a heavy formation of ME109s over Germany. "....Clip from History Channel's Dogfight series on desert aces. This episode first aired on August 10, 2007. Giora Epstein participates in his first dogfight after only three prior combat missions, marking the beginning of his successful career. Giora Epstein is the world's leading ace with seventeen kills, 12 of which were achieved in the Yom Kippur war, 9 of which were in 48 hours...."
"I'll give 5 or 6 cheers for Mama Cree! I'm having so much fun I'm rethinking some of my land-rights choices on other sims. I may scale back here and there to free up dollars for more land-rights in future Taloo sims. 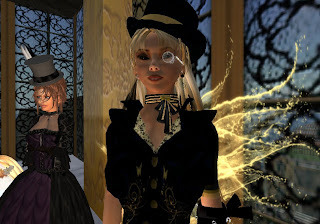 That says an awful lot for this steampunk girl." I wonder how many others feel the same way...."
I was helping Phineas Messmer with his new night owl spot in New Toulouse the other day, when we took a break to enjoy the new parcel music he setup. We agreed that "Martini in the Morning" was the best compromise for the club. It swings, it's romantic, and although not always in theme with New Orleans 1920s Jazz, we think people will like it. Our dogfighting air battle will take place on Saturday March 22nd, but not on Easter Sunday the 23rd. Our regular scheduled air battles will resume for both Saturday and Sunday on the following weekend. March 29th and 30th. We're sorry, but this discussion has just been closed to further replies. Each pilot will take off from the runway at the Connolly Aerodrome in Caledon Penzance. Then they must fly through each of the checkpoints around Caledon, then land back at the Aerodrome, where the clock will be stopped. As the event is hosted by the RCAF, the force's rules apply to the time period of aircraft. Basically: post-WWI is too late. Steampunk is fine! 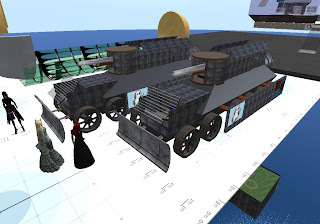 Racers may not participate in a vehicle consisting of more than 30 prims (eg: multimove airships). Though multimove vehicles would be very unlikely to win anyway!...." ".....Prim Perfect will be a year old in May. During the last ten months, we’ve grown from 0 to 10,000 readers, and we’ve launched a TV show - Meta Makeover. Now we’re ready for our next big venture - a new magazine! In collaboration with the Connolly Telegraph, we will shortly be launching a wholly new magazine with a very special twist. 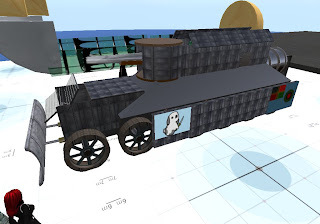 This is one catering for the large number of people in Second Life who are interested and involved in the steampunk and historical recreation sims covering a period between 1740 and 1920 (that is, roughly speaking, the period covered by sims from Versailles to New Toulouse). It will be centred on the Independent State of Caledon, but it is hoped that all the other period sims will become involved and play a part too. It will draw on the existing strengths of its partner founders; the news gathering skills and content experience of the Telegraph, and the design, production and features writing of Prim Perfect....."
I almost missed my blogiversary! My blog is one year old this very day. And here's the very first of many boring posts I've created in the past year. Hah! 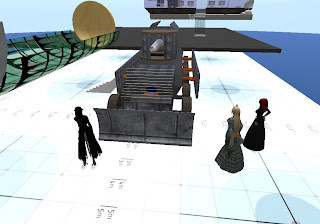 Back then I had one rental home with 500 prims. How could I possibly need more than that? (grins). I worked as a dancer in several clubs and collected dozens of guns. 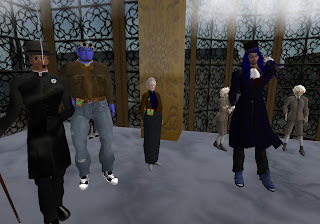 About a month later I created the inworld Second Life Bloggers group. This photograph was taken during one of several meetings with Saffia Widdershins and her staff. 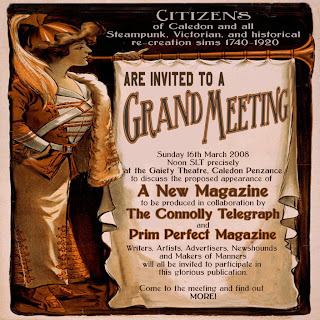 We have been discussing a partnership between Prim Perfect Magazine and The Connolly Telegraph (TCT). 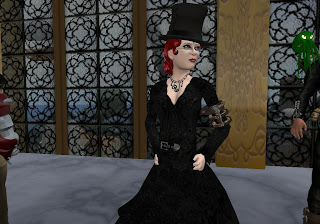 The fruits of our labours will be an inworld magazine version of TCT that covers the Victorian Steampunk world as well as New Toulouse and a few other themed sims of note. This weekend we will discuss opportunities for writer's and photographers during a public inworld meeting in Caledon Penzance. The Connolly Telegraph is not going away. This is an expansion! The resident's of Taloo are beginning to setup and settle. My good friends Elle, Phin and Sin are setting up too. Elle has a great new store with plenty of 1920s getups. Phin has just started on his Jazz Club (I gave him a new microphone that's the bee's knees!). And Sin is getting his Air Courier Service up and in the air. What a fly boy! My own lot, Zoetrope Theatre and Studio has all the basics in place. So don't be a killjoy! This is on the level! Stop over and visit us in New Toulouse! The Prop Spinner's Pub is a Royal Caledon Air Force themed venue located in Caledon SteamSkyCity and owned by Group Captain Thadicus Caligari. I must say I had a great time dancing and meeting some new faces, too. It's also nice to see an older Caledon sim get a little more life again. I took the liberty of creating a New Toulouse group on Flickr. Enjoy everyone! 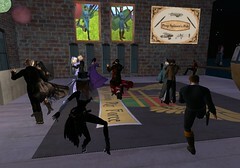 The Second Life Bloggers Ning Social Newtorking Group is growing rapidly! One of the best social networking forums I've encountered is Ning.com. Winterfell was the first community I knew of to use it. 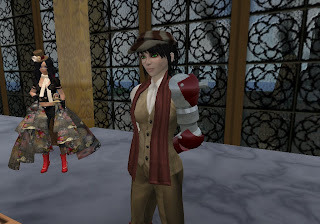 When Carricre Wind asked me about blogs and forums to use for her New Toulouse sim, I recommended she also use Ning.com. 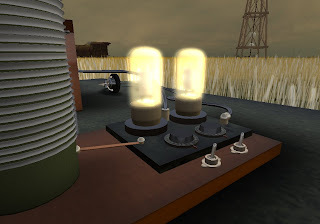 Then I started using it for the Royal Caledon Air Force and later, Rafael Fabre created a network for New Babbage. I've found it to be a great tool and one you can easily navigate within various Ning.com networks. 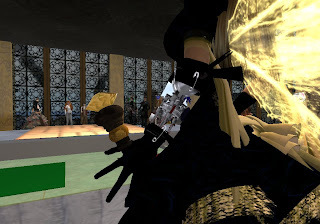 If it were possible to do so (in a dramatic science fiction way with lots of special effects and a smashing soundtrack), would you transform yourself into your avatar(s) and remain in SL permanently? I'm not sure how to answer that. Sometimes I think it a silly question and dismiss it immediately. Other times when I'm in a mood I think: "Hell Yes!" Today I'm in that "Hell Yes!" kind of mood. But now the giant hook has arrived to pull me back into Real Life. The RL daydreaming starts again....while friends and family wonder "Why is she so distracted?" Another inspiring Real Life Aviatrix blog....more Chopper Chicks! The Rusty Prop is a new unofficial haunt of the Royal Caledon Air Force located on Aether Isle in Caledon SteamSkyCity. The new pub is owned by pilot Mishi Rossini. Practice Lap using a different camera perspective. 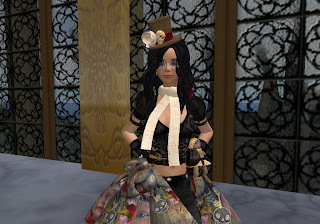 Table dancing in New Babbage in shameless defiance of theme! 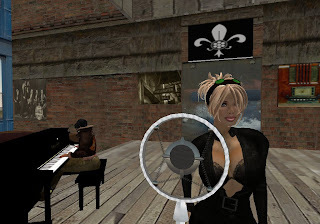 Zoe Connolly plays the Moonlight Sonata while contemplating her daily agenda in Second Life. I happily stumbled upon this site whilst seeking Goggles for my steampunk look in RL. Miss Kara Wind and Miss SimplyAmy Iwish of the Royal Caledon Air Force Research and Development Team are most diligent in the laboratory. The following photographs of the RCAF Ironclad Land Ship illustrate the fruits of their labours. Topics of discussion: The upcoming film, roleplay events, and new sim on the horizon. Also a St Patrick's Day Party on Saturday March 15th.